A number of airlines could soon be flying Guyana’s friendly skies following the inking of 16 Air Services Agreements (ASAs). This development follows on the heels of The Guyana Civil Aviation Authority’s (GCAA) attendance at the International Civil Aviation Organisation (ICAO) Air Services Negotiation (ICAN) event, hosted by the Kenya Civil Aviation Authority in Nairobi, Kenya from December 10 to 14, 2018. The annual ICAN event provides a forum for ICAO Member States to conduct multiple bilateral and plurilateral air services negotiations, consultations and networking opportunities. Delegates from 71 ICAO contracting States participated at ICAN in December 2018. The Guyanese delegation, which comprised the Director General of the GCAA, Lt. Col. (Ret’d) Egbert Field, and Director for Air Transport Management, Mr. Saheed Sulaman, conducted 26 meetings at ICAN. These negotiations will set the framework for expansion in air connectivity of Guyana with the rest of the world, and aid Guyana’s efforts in becoming a robust international air traffic hub. These meetings resulted in the conclusion of 16 ASAs with Luxembourg, Democratic Republic of Congo, Burkina Faso, United Kingdom, Mozambique, Sri Lanka, Cameroon, Oman, Malaysia, Jordan, Zimbabwe, Colombia, Morocco, Gambia, Rwanda, and Tanzania. These agreements were initialed and Memoranda of Understanding were signed with these countries. 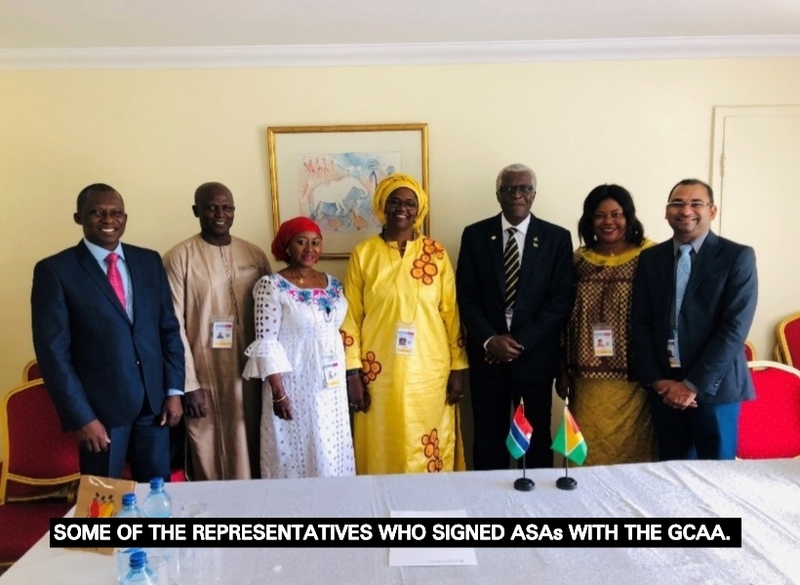 Pending signature of these agreements at the Ministerial level, the agreements are provisionally applied, which means airlines from other countries can commence flights to Guyana at any time provided that they are operating by the conditions outlined in the ASA’s. Negotiations for ASA have commenced with Cote d’Ivoire, Sierra Leone, The Bahamas Senegal, and Saudi Arabia. The negotiation of these agreements is complementary to the work started at the ICAO Air Transport Meeting which was held in Guyana from November 21-23, 2018 under the theme “Promoting Connectivity for Sustainable Air Transport Development”.